Keisha A. Spigner joined Community Voices Heard as the Individual Giving and Events Coordinator in September 2017 and in early 2018 transitioned into the role of Communications & Giving Manager. 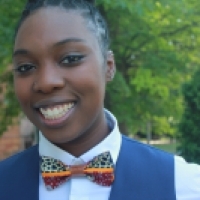 Prior to joining CVH, Keisha worked as an individual giving consultant raising thousands of dollars for transformative programs that amplify the voices of working class communities and queer communities of color. Keisha also led aggressive branding and donor communications initiatives to help establish clear messaging and tone, as organizations sought to engage more diverse audiences. Believing that organized money and people are key to building power, Keisha has worked on campaigns to reclaim public lands and increase affordable housing for black and brown communities. As the child of a Ghanaian immigrant, Keisha is dedicated to disrupting and dismantling systemic violence and oppression as well as the inequitable distribution of resources and power that leave working class communities vulnerable. Keisha seeks to center those at the margin of the margins, with an acute focus on Black womxn, LGBTQ*, and immigrant communities.